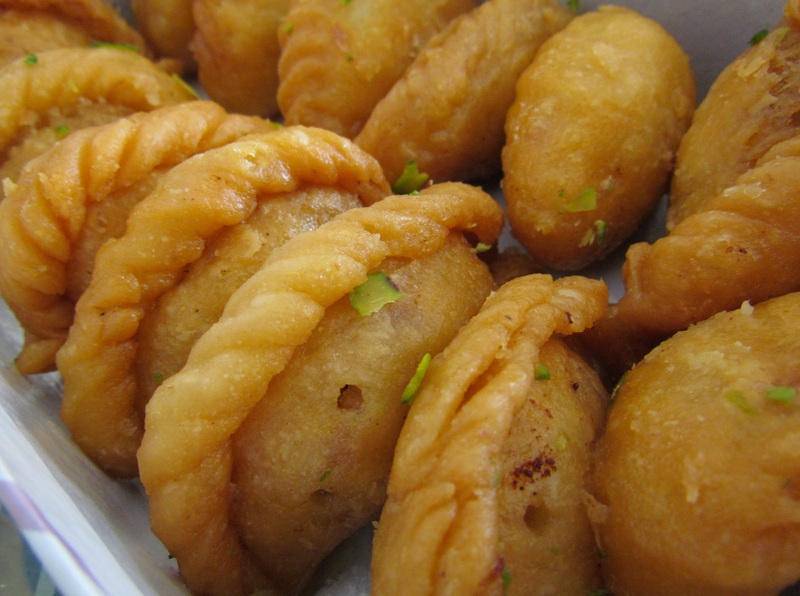 Gujia: Gujia a cuisine of North India particularly Uttar Pradesh, Bihar, Madhya Pradesh and Rajasthan is a sweet dumpling made with suji / Maida flour / wheat flour and stuffed with khoya. The packaging of a gujia is very much like that of a samosa, however the gujia has a very distinct shape. The gujia is filled with a mixture of grated and roasted dry fruits, khoya, coconuts and to add a grainy texture, a little suji (coarse ground wheat flour). Sieve the maida flour with the salt. Mix in the 6 tbsp oil with the maida. Add in some water and knead lightly. Keep adding water as required and knead into soft but tight dough. Mash and fry the khoya in a frying pan till light brown in colour. Add in the powdered sugar and cardamom powder. Add in the almonds, cashews, coconut and raisins. Divide the dough into 20 similar balls. Roll out each dough ball into a small round of about 4 inch diameter. Prepare all the gujia‘s in the similar manner. Heat the oil for frying in a deep kadhai. Deep fry the gujia‘s in batches on a medium flame, till golden brown. Serve the gujia’s at room temperature. Gujia’s can be stored in an airtight glass jar, for 2 weeks. Gujia molds can also be used to prepare the gujia. While using molds, place the rolled dough ball in a greased gujia mold and fill a tbsp of filling mixture on one side. Moisten the edges of the round and fold one side of the mold over the other. Remove the excess dough edges and reuse.